Soution: Well, there seems to be an obvious answer here. We can iterate through the array and for each element, we iterate and then iterate again to check all three element combinations. And, so long as we're careful and make sure that we use distinct elements, we can get this right. Well, this works beautifully and is a very simple solution. There are a few optimizations possible (like starting j at 1 and k at 2) and combining the two if statements, but basically this is pretty sound. What is the algorithmic run time for this? Well, since for each element, we check each element and then check each element for that, we have an O(n) with another O(n) for each n and then another O(n) for each of those. This results in a run time of O(n^3). 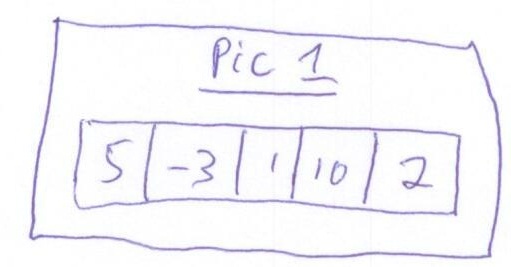 Pic 1 shows an array that will sum to zero. How do we know this. Well, we can see that -3 + 2 + 1 = 0. Now, how did we inuit this? What you probably did, was check the sums, and then see if there was a value which was opposite that (e.g., negative if the sum was positive, and positive if it was negative). You didn't have to actually check the sum of each element, only the membership of the opposite of the sum. This will give us an O(n^2) algorithm, but at the tradeoff of needing a data structure. Beautiful. This is an example of an obvious solution being nice, but inefficient. It's good to always get to a working solution fast. Then, by doing an example and intuiting what we were doing, it's possible to build a much more efficient algorithm. And, the coding isn't too difficult; it's mostly the algorithm here. your program return false if the array is [7, -3, 1, 10, 2]. you don't need two for loops, the hashtable already include sum for PAIRS, so you just need to find the third element. 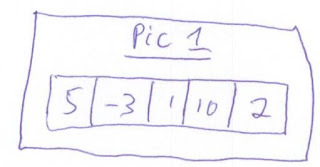 Another solution if you want to use only constant additional space is to sort the array, calculate the pairwise sums and then do a binary search for the opposite value (rather than a lookup from the hashtable). This is O((n^2)logn) runtime, O(1) space.